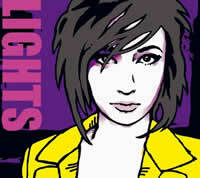 I didn't really know anything about the artist known as "Lights" when I first heard her music. I was just watching television at a random hour when a commercial break started and an Old Navy commercial popped up. A bunch of 20-year-old girls were out shopping and giggling gaily without a care in the world. I wasn't sure whether this was an endorsement for clothing or for more lax gun control, but I watched the entire 30 seconds, not because of the girls but because the song playing wasn't half bad. Granted, it was fluffy dream pop, but it was fairly uplifting. So whenever Old Navy commercials played, I listened. Then a few months passed, and during my early morning television flip before heading off to another day at work, I stumbled across a song from one of those commercials, except it was a music video featuring a young lady in a space costume flying around in a rocket ship. So...this is the face to match the voice, eh? Hmmm... why was she utilizing spacecraft? She calls herself "Lights". I have no idea why, but I imagine it is light-related. Canadian-born from Timmins, Ontario (famed for country go-getter Shania Twain and...um...the Shania Twain Centre, which contains memorabilia and artifacts concerning Shania Twain), Lights, also known as Valerie Poxleitner, had originally auditioned to be a model for Wal-Mart when she was 15, an unsurmountble ambition, I'm sure. She posed with a guitar, and they asked her if she played. She did, she played, and they hooked her up with a manager that day. It must be pretty easy to get a manager. Anyway, fast forward to 2008, and she has a record out. February Air follows the same pattern as the previous two songs with lots of bubbly audio and funky pops. This is the one I saw on the Old Navy commercial. Apparently, people were getting cold in the February air, and they needed to buy coats from a faceless corporation. White appears, showing off a more powerful drum beat and a bit more symphonic side of Lights. I think I had heard this one somewhere else as well, though it's not nearly as familiar. And the bubbliness continues with I Owe You One; heck, this whole album is bubbly. Her voice sounds a bit different, though... oh, it's a higher octave, that's why. I am drawn to this song for some reason... why, you ask? I have no idea. It's just very warm! But I'll let The Last Thing On Your Mind cool me down with some more downtempo music that sounds a bit more like a typical popstar's output -- a bit more alternative-oriented, and a bit more distant from the rest of the EP. I guess rock was the last thing on her mind when she was writing the album's tracks. So the best thing I can say is that this album can't possibly make you unhappy. I don't mean that everyone is going to be happy with the type of music here, but it could definitely be a temporary cure for depression. That is for certain. Even though it's a bit corny, I do look forward to more music from Lights. Let's hope for great things from her next full-length album, scheduled for September 2009.